Learning to Type Dvorak: Week 4, Maybe? You are here: Home / The Experimental Life / Learning to Type Dvorak: Week 4, Maybe? 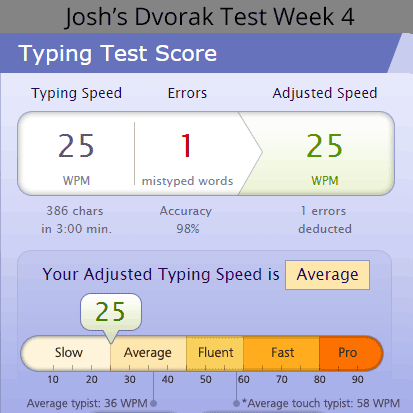 I was pleased when I first saw my typing test results for this week. I broke 20 wpm. I broke into average. But then I remembered that it has been two weeks since my last test, which means my pace hasn’t picked up much. I guess I have been feeling a little more comfortable with the Dvorak layout, so maybe I was expecting a better showing. It’s like when you’ve started eating better or getting more exercise, and you’re feeling good, but then you step on the scale and nothing has changed. Much like with the health situation, it would probably help for me to remember that the weigh-in isn’t always the most important benchmark. To celebrate that idea, I wrote this entire post in the Dvorak layout. It didn’t feel great, but it didn’t make me want to scratch my eyes out.